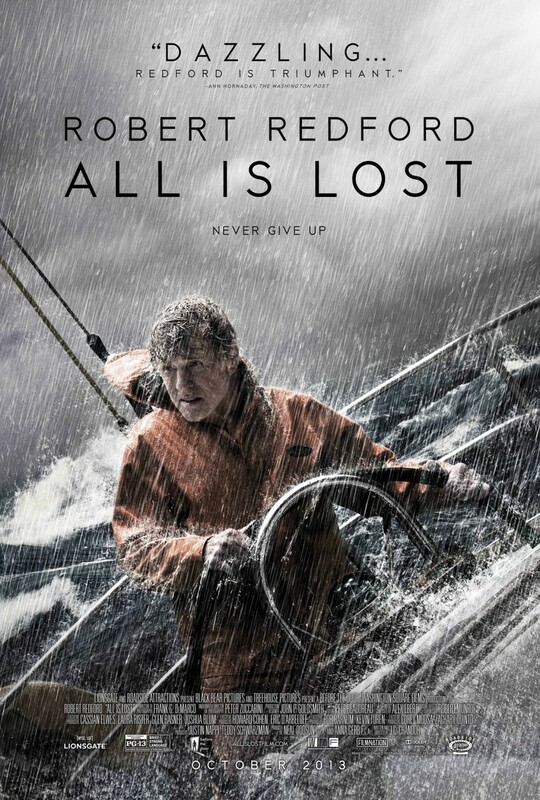 First we had Sandra Bullock trapped alone in space, then it was Mia Wasikowska traipsing through the Australian desert all by herself and now we have Hollywood veteran Robert Redford as a lone sailor adrift on the high seas in All is Lost; talk about a recurring theme. This sophomore film from J.C. Chandor is a vastly different animal to his excellent 2011 debut Margin Call, a drama rich with delectable dialogue and a stellar ensemble cast. With just one actor and virtually no dialogue whatsoever, All is Lost could not be more dissimilar. The film showcases both the stunningly executed vision of the filmmaker and the talents of Redford as an actor, creating a suspenseful drama that pits our ageing unnamed protagonist against all manner of setbacks. With his only lines coming via an opening voice-over and an ill-fated radio transmission, Redford is required to show – rather than tell – the physical and psychological angst that his character experiences, which he achieves with sublime subtlety. The story is very simple. A man alone at seas finds himself floundering when his boat is damaged after contact with a shipping container. Although able to fix the gaping wound to the side of the hull, a loss of power means a loss of communication equipment and navigation aids, which leaves him in the path of an approaching storm. More chaos ensues as he battles the elements to remain afloat in light of even more damage to the boat. Eventually forced to abandon the yacht for a life raft, he is at the mercy of the currents and desperate to attract the attention of passing ships. Redford is so natural in his performance that it is only his instantly recognisable features that serve to remind us that this isn’t real. The swaying movement of the camera with the boat and the confined spaces of the cabin ensure that the audience always feel a part of what is, at times, a claustrophobic experience. 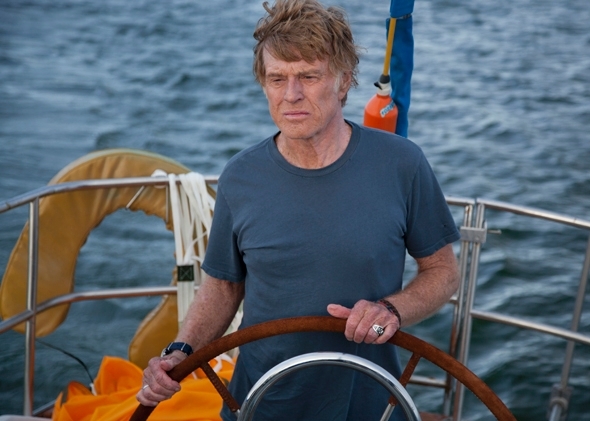 Despite the odds stacked against him, Redford’s character – identified only as Our Man in the credits – never panics, going about his business in a methodical way, exactly as you would expect an experienced seafarer to react. However, this lack of urgency also creates great tension and leaves you constantly dreading what is to come. This is a genuinely suspenseful film and it is great credit to Redford and Chandor, who also wrote the screenplay, that they have wrenched so much tension from the scenario. With not a tiger in sight, our survivor is all alone and we never encounter another person for the entire running time. This is essentially a story of an average man forced to overcome the odds stacked against him and Chandor resists the urge to ramp up the action beyond the believable. The cinematography from Frank DeMarco and underwater expert Peter Zuccarini is superb and the film is visually stunning; the confines of the cabin juxtaposed against the endless expanse of the Indian Ocean; the glow of the glistening sunsets contrasted against the dark menace of the looming storms; the azure glow from above whenever we delve below the ocean surface. Likewise, the soundscape is mesmerising with music from Alex Ebert’s Golden Globe-winning score melding seamlessly with the various noises that occupy the story space; the likes of squawking birds, waves, the creaks and groans of a boat under stress, pounding rain and sails flapping in the breeze. It is an assault on the senses that is a richly rewarding cinematic experience. Redford has rightly been awarded for his performance in this role as he presents this sailor as the everyman personified, no mean feat given his elevated status within the industry. Just as Gravity and Tracks have also done in recent times, All is Lost delves into the world of a person isolated from the wider world in which they live and forced to fight against all odds to find their way home. With All is Lost, Chandor has constructed a gripping treatise on the strength of the human spirit in the face of extreme adversity when all does in fact seem lost. Previous Previous post: Are We Officially Dating?